Sam took part in his first half marathon – the farthest he’s ever run – at the beginning of March. He completed it in two hours and 39 minutes, something he wouldn’t have thought possible over a year and a half ago when he started running. Sam after completing the half marathon! He completed it in two hours and 39 minutes, something he wouldn’t have thought possible over a year and a half ago when he started running for the first time. Previously Sam couldn’t even run around the block without fear of collapsing but following heart scares as young as 30, Sam took action. He says: “Cancer unfortunately affects so many of us. The year my daughter was born, we lost three family members to cancer; my grandad, my partner’s dad and her grandad. My dad also suffered with this terrible disease but luckily he survived and got the all clear and is still with us today. Sam didn’t have a fundraising target, instead he looked to raise as much as he could. 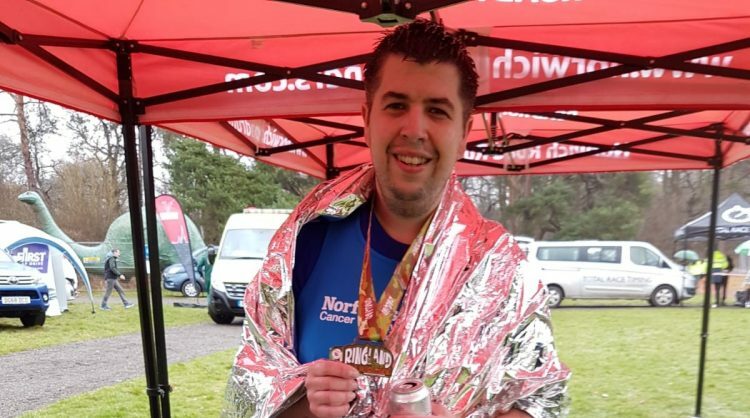 Before the run he said: “Whatever I raise is more than it would be if I wasn’t doing this and that’s what matters.” We’re pleased to say that his total came in just under £200!